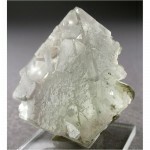 A choice specimen of beautiful green Prehnite with Epidote from Mali. 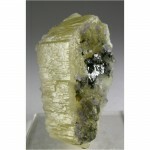 It features a graceful formation green Epidote crystals which are hosting numerous groups of botryoidal Prehnite crystals. In excellent condition, with great views all the way around. 4.6 x 3.5 x 3.0 cm.